GIGANTE SPENT 2017 WITH YOU! Wow, another year of gigantic theater, and this one has propelled us into our 30th Anniversary Season! We are thrilled and thankful to you for all you’ve done to make it possible. In January, Theatre Gigante launched 2017 with a performance at the University of Maribor in the city of Maribor in Slovenia. The performance, titled THE WAY THINGS GO, was written by Mark Anderson as a monologue 25 years ago, and was adapted by Isabelle Kralj for two people and a drummer. The performance was wonderfully received! In the audience was awarded Slovenian playwright Rok Vilčnik, and after seeing the show, he commissioned Isabelle, Mark and Melita Koletnik, Professor of Translation at the University of Maribor, to translate his play TARZAN. The task was completed in August, and Gigante will be presenting the English version of this fabulous black comedy in March of 2018! Theatre Gigante’s second performance took place in March. Regular Gigante musician/composer/performer Frank Pahl’s LITTLE BANG THEORY, the dazzling and sublime musical performance group from Ann Arbor/Detroit, comprised of Frank, Terri Sarris and Doug Shimmin, accompanied a screening of Lon Chaney’s 1928 silent film, LAUGH CLOWN LAUGH, with an original score. This magical weekend took place in Kenilworth 508 Theatre. Also in March, Gigante once again donned Peter & Wolf attire and performed their PETER & THE WOLF & THE ONE MAN BAND in schools throughout Milwaukee and Waukesha Counties. This program, sponsored by the Milwaukee Symphony ACE Program, is a big hit with the first graders and great fun for the performers, as well! Then, Alverno College invited Gigante to create a work to be performed in April in their Pitman Theatre. Gigante jumped at the wonderful opportunity, and Isabelle re-adapted Mark’s THE WAY THINGS GO – only this time, for ten performers, including Frank, as a one-man band. THE WAY THINGS GO became a cacophony of musings, thoughts, and ideas, in which performers guided the audience through a humorous evening of text, movement, song, and music, poetically embracing the mystery of life, with juggling balls, bicycles, stilts, cubes, microphones, chairs, and a whole slew of fun instruments! The cast members are masterful in their movement; perfectly in sync, they go from embodying a group therapy session to Sir Isaac Newton’s cradle to the night sky. It is a philosophy class at the circus…Theatre Gigante’s composite of movement, song and speech endeavors to provide a platform to engage in a conversation about “you-ness” and tackle no less than the meaning of life. In August, Theatre Gigante opened its 30th season at the second annual Milwaukee Fringe Festival with a performance of Frank O’Hara’s poem, LEXINGTON AVENUE, delightfully set to music by Jason Powell and performed by Powell and Erin Hartman, with Anne Van Deusen on piano. In September and October, Gigante audiences were introduced to Charlotte Von Mahlsdorf, Berlin’s most notorious transvestite, in Doug Wright’s I AM MY OWN WIFE, directed by Isabelle and featuring Michael Stebbins. This timely play was beautifully embodied by Michael, who played over thirty-five characters, including the charming, enigmatic Charlotte. November brought the brilliant performer David Gaines and his one-man comedic powerhouse, 7 (x1) SAMURAI, back to Gigante audiences, where he delighted capacity crowds. In attendance was a group of 7th and 8th graders from Highland Community School and a group of UWM theater students, with faculty from the Theatre and Dance Departments. Besides gracing the stage with his performances, David also taught a fabulous theater workshop at Pius High School. The percentage of people likely to be satisfied this weekend by Warner Brothers’ Justice League isn’t likely to be nearly as close to 100% as it is with Theatre Gigante and David Gaines’ 7(x1) SAMURAI. Anybody can tell a heroic adventure story with a few hundred million dollars. It takes a special kind of crazy to tell this kind of story with one guy live onstage…and it’s a lot more fun to watch…Hollywood could learn a lot from Gaines. 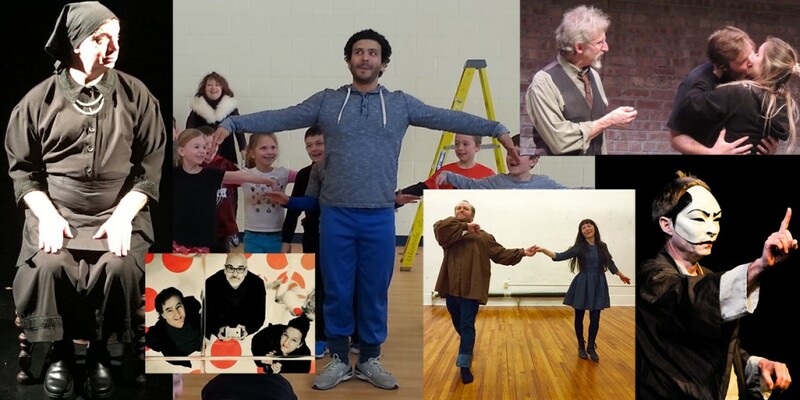 All of these artistic activities are made possible with your help – by your attendance at our shows, your word of mouth, and through your generosity in the form of financial donations. In this Holiday Season – and for Gigante’s 30th Anniversary – we hope you will consider investing in Gigante by sending a tax-deductible donation. Thank you for everything!